Thousands of years ago, the Giants fought epic battles in Skylands but were banished to Earth. With a new threat looming, it’s time to bring them back to join forces with the Skylanders to defeat KAOS. Only you can put them on the Portal of Power to unleash their strength in the ultimate battle to save Skylands! While journeying through a misty lagoon in the clouds, Gill Grunt met an enchanting mermaid who he vowed to return to. When he came back years later, he discovered pirates had kidnapped her. Heartbroken, Gill Grunt began searching all over Skylands. Though he had yet to find her, he joined the Skylanders to help protect others from such evil. A new range of characters to develop the ultimate collection. 8 new and unique Skylanders, one for each element group. 24 redesigned Skylanders with increased powers, level caps and abilities. For ages 6 years and over; EAN/MPN/UPC/ISBN: 5030917116490. 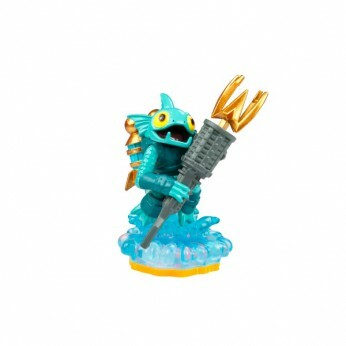 This toy costs approximately £6.74 (for the latest and best prices make sure you check our retailer list for the Skylander Giants: Single Figure – Gill Grunt above). In our review of Skylander Giants: Single Figure – Gill Grunt we classed it as being suitable for ages 8 years, 9 years, over 10 years but recommend you check the manufacturer specific advice before purchasing.